The Sox have peaked, so have the Pats and the C's -- now it's time for the Bruins. 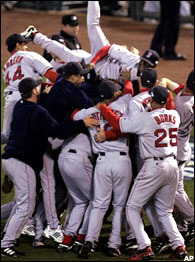 After peaking as a Red Sox fan (October, 2004), Celtics fan (the Bird Era) and Patriots fan (the Brady Era, ongoing), only one hurdle remains: The Stanley Cup. There was a time when I loved the Bruins as much as any other Boston team, but owner Jeremy Jacobs sucked the life out of me. If he didn't care about the Bruins, why should I? Also, the game was changing, and not for the better -- once the Devils rolled out that hideous zone trap in '95, the NHL should have just outlawed fighting, power-plays and rowdy drunk chicks in hockey jerseys. What a disaster. And so hockey faded out of my life. In retrospect, I wasn't alone. After the NHL disappeared last fall -- a victim of overexpansion, skyrocketing ticket prices, absurd salaries and comically bad leadership -- the silence was deafening. Few people cared. Last winter and spring, when ESPN replaced hockey with random college basketball games (and I mean, really random, like Cadwallader State taking on Kahua Community College), women's softball, college lacrosse and just about anything else: "Up Close and Personal with the Sklar Brothers," "The Spelling Bee: Quarterfinal Regionals," "Budweiser Hot Seat: The Series," "Stu Yeah!" you name it, the show would top the NHL's ratings from the previous season. Clearly, this sport wasn't just in disarray -- it was being dismissed altogether. After 301 days, a canceled season and sweeping indifference, the NHL and its players came to a sobering conclusion: Let's fix this thing. And it was about damned time. Q: What was the point? What was gained? at least, that was the plan. Once those bills started piling up and public pressure mounted -- oh, wait, there wasn't any public pressure -- they folded and accepted a considerably worse deal than they were offered six months ago. You know, the one that could have saved the season. So to recap: Canceled season, lost wages, angry fans, worst deal possible. Ladies and gentleman, the NHL players' union! Q: What was the biggest mistake the players' union made? You mean, other than canceling an entire season, then caving? The players' biggest mistake was trying to protect a salary structure that made no sense in the first place. Look, we all knew hockey players in high school and college -- they're good guys and hard workers, they stink like sweaty hockey equipment, they can drink until the cows come home, they have no problem walking around naked in front of other guys, and they would absolutely be happy playing professionally for $20 an hour. This is a blue-collar sport for blue-collar fans, people who should never have to pay more than $35 to $40 for a ticket. And the players fit right into that. So why pretend that hockey players should be getting $10 million to $12 million per year?